You don’t have to be a porcelain aficionado to enjoy Arita. I didn’t really know what to expect myself before I went, because porcelain isn’t exactly my thing. But I am so happy that I went anyway. 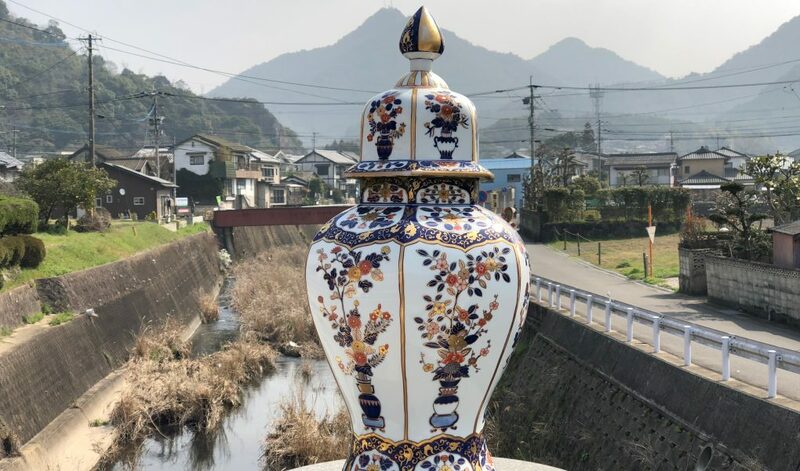 Arita is a scenic little town full of Japanese culture and history, and all this actually sparked some interest in me for the porcelain. 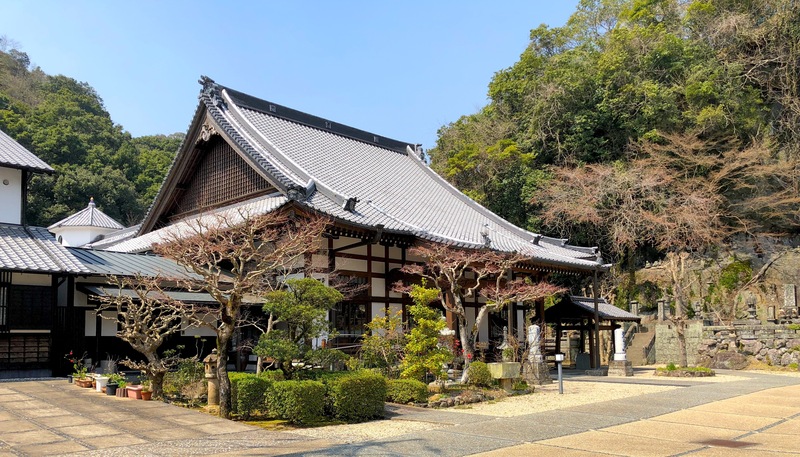 This post quickly covers the history of Arita, then continues with my personal experience there and finally lists the main attractions to help you plan your own visit. Arita’s growth from a regular Japanese village to an internationally recognized source of quality porcelain started over 400 years ago. In the late 1500’s Japan attempted to invade Korea a few times. The conflict with Korea ended in 1598 with the Japanese leaving the Korean peninsula. Many feudal lords brought Korean potters back with them to Japan. Nabeshima Naoshige, a feudal lord from Kyushu, also brought back Korean potters. A few years later a source of Kaolin, the clay used for porcelain, was discovered in the mountains of Arita. The discovery of Kaolin and production of the first Japanese porcelain is generally attributed to Kanagae Sanbee (also called Yi Sam-pyeong or Sanpei Li) but it appears to be disputed if this is really true. No matter who the success is attributed to, Arita became world famous on account of it’s fine porcelain. Japanese porcelain gained a great reputation especially in Europe during the 17th and 18th century. Arita porcelain from this time period is often known as Imari Ware in Europe because the porcelain was branded with the name of the port from which it was exported. In the 19th century Japonism, an obsession with Japanese arts, swept across Europe and Imari Ware gained popularity again. Apparently even today some Arita porcelain is branded as Imari Ware, but collectors only consider Imari Ware from the two periods mentioned above as the real Imari Ware. When I got of the train in Arita I had no doubt that I was in Japans premier porcelain town. The tiny train station was packed with information of all the porcelain related attractions, and a small, very moddest looking, shop sold some local products. Even the handrails of the stations stairs were made of porcelain. If you arrive by train I recommend that you grab a free map at the train station. They are available in a few languages, including English. 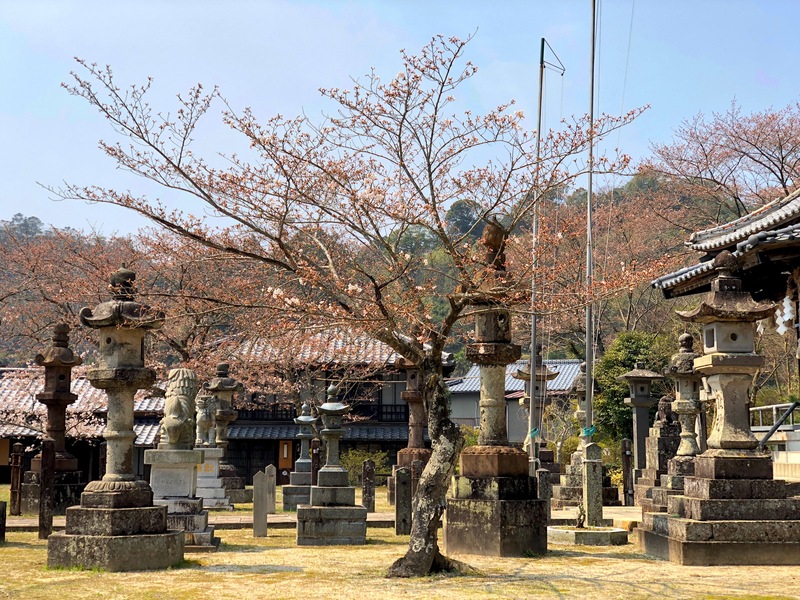 The attractions of Arita are spread over a large area, so if you don’t have a car you will be in for some serious walking if you don’t plan well. I didn’t have a car nor did I prepare well so I was very happy that I wore good walking shoes that day. When leaving the station I walked down the large street in front of the main entrance of Arita Station. It is the direct route to the Kyushu Ceramic Museum. After a few minutes I reached the river, and crossed a bridge. The bridge was beautifully decorated with large ornamental porcelain vases painted with delicate flower patterns. This bridge is an amazing photo spot. Across the bridge I walked up the stairs to a rather uncharming pedestrians bridge which took me to a hill covered in blossoming cherry trees. The museum is located at the top of the hill. The walk to the museum was nice, through cherry trees and with a beautiful panoramic view of Arita in the valley down below. I was quite unfortunate, or unprepared I should probably say, as the museum was closed. 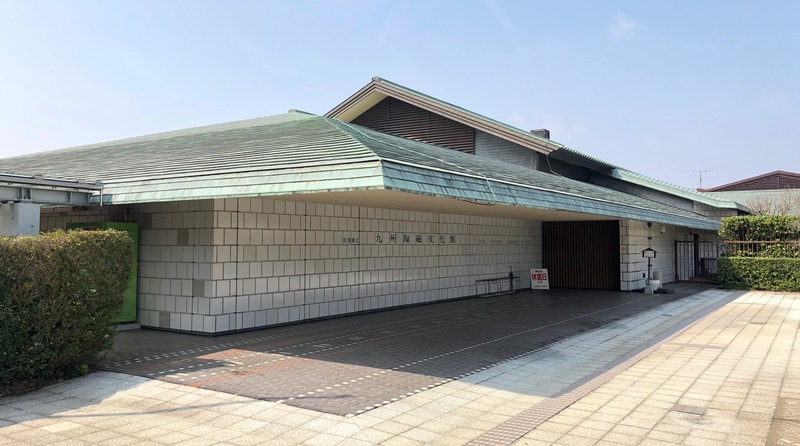 Like many museums, the porcelain museum in Arita is closed on mondays. A quick walk around the building didn’t reveal much of interest, and instead I decided to decent from the hill and continue to Aritas Main Street. After walking down the street for 20 minutes I started getting the feeling that I wasn’t in the right place. Which was true. Had I instead taken the local train to the next station, Kami-Arita, then I would have been much closer to the old city. Nevertheless I had a great walk along the seemingly abandoned main street. Monday is the perfect day if you want to have Arita all for yourself. Along the way I stopped at a few shrines and temples. The first one I encountered was Yasaka Shrine, a shinto shrine pulled a few hundred meters back from the road up against a forrest. Upon entering the shrine area I immediately got the feeling that this was an abandoned shrine. The Torii gate, statues and the shrine building were not well kept and the grounds were dried out and moss covered. It did however have an appealing feeling, like this was once an important place, so I found a bench which wasn’t broken and took a seat. I reflected on the passing of time, and read my book for half an hour until I was interrupted by some nosies coming from the forrest next to the shrine. Suddenly, a small kid came running out of the woods onto the temple grounds. He stopped, looked at me with an expression of surprise, and said “Konnichiwa” and ran off. It was kind of scary, but he probably was as surprised as I was. I left Yasaka shrine and continued down the road towards the old town. Shortly after I came across the Hoonji temple. I went in and took a look around. It was a beautiful and well kept temple with many references to the porcelain industry. Behind the temple I found some hidden stairs leading up the hill side. I ventured up, and here a whole adventure on it’s own started. I will tell that story in a separate post, but I encountered overgrown paths, view to a cemetery and a number of seemingly abandoned small shrines and once important places of worship. 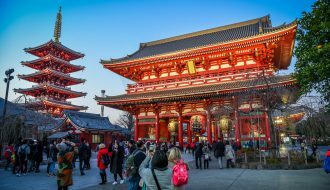 Shortly after I returned from my little side adventure I came across the Keiunji Temple, a Zen temple located along the main street. The temple is protected by some very fierce looking guardian statues. Inside the temple area was a small beautiful stone garden and an old wooden bell tower. Once a year this zen temple hosts the Arita Ceramic Bazaar, a very popular event with many visitors. As I stood there enjoying the silence and beautiful garden, it was hard to imagine this place being overrun by 1 million people as is the case when the Bazaar is on. I had barely seen a single person for half an hour. 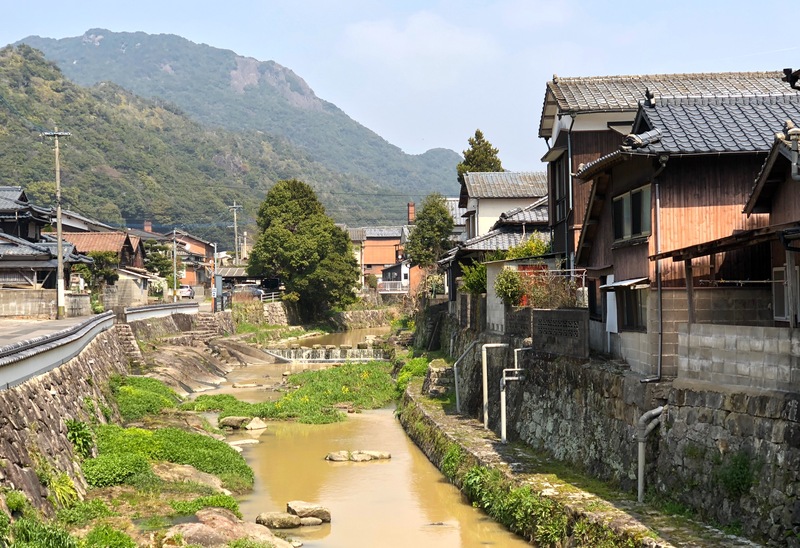 I continued my walk through Arita, enjoying the peaceful backstreets, calm stream and the silence of the town. While browsing a few ceramic stores I fell in love with a set of beautifully painted tea cups, decorated with a delicate sakura pattern. Unfortunately they were very much over my budget, so I had to leave the store empty-handed. Caught up in my own thoughts I missed the Tozan shrine, one of the main attractions in Arita. I’ve listed it in the attractions section of this post so you don’t miss it! I strolled up to the large ginkgo tree which is famous for it’s immense size and age. The tree stands around 40 meters (131 ft) tall and is said to be around 1000 years old, hence outdating the porcelain production of Arita by 600 years! It is indeed a stunning tree – a good place for a rest, and a perfect ending to my day in Arita. I ended up at Kami-Arita station, a station with a very old and well kept station building. From there I took the local train back to Arita Station to catch my train back. The Ceramic Museum of Kyushu is located in Arita, on a green hill overlooking the town. It focuses on the ceramics of the diferent areas of Kyushu, and aims to preserve and teach about this important part of Kyushu’s cultural history. The museum has impressive collections spanding from Old Arita Ware to modern ceramics. Generally open all days except Monday and certain holidays. Check their website for up to date information. The main shopping street of Arita is lined with ceramics shops, outlets and workshops. For several kilometers shop after shop put their (mostly) beautiful cups, plates, bowls, vases etc. on display. It is hard not to fall in love with a set of bowls or cups somewhere along the walk. While you can get affoardable products here and there, you need to be prepared to spend some money if you want to bring home some of the nice goods. Arita porcelain can be quite expensive. 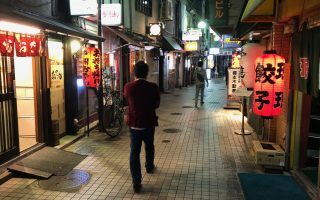 The best way to explore the shopping street is to take the local train from Arita Station to Kami-Arita station which is located closer to the shopping district and old part of town. Alternatively rent a bike or take a bus. When exploring the shopping street in old town Arita you can easily explore the old backstreets. The small streets between the Main Street and the river bring you right back to the “old” Arita. You really get the feeling of walking around the famous porcelain town hundred years ago. On a week day it can be so quiet here that you almost feel alone. Enjoy the beautiful old houses and historic Tonbai walls. These walls can be found in the back alleys of the old town of Arita. Made from old kiln bricks and pieces of broken pottery the walls were supposedly raised by potters years ago to block competitors or curious souls from observing their secret production techniques. This is something unusual and one of those things you probably only find in Japan. 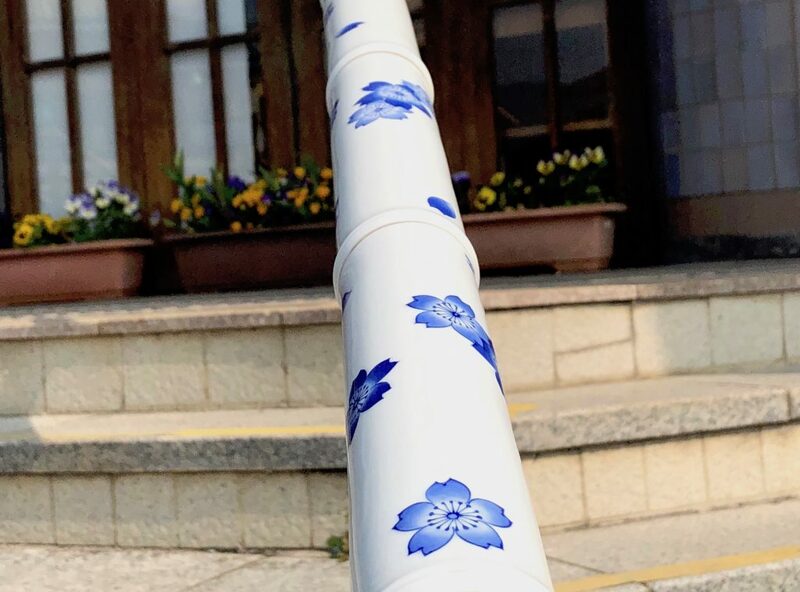 A theme park dedicated to porcelain. But that’s not all. It’s contained in what appears to be a recreation of an old German village, with a stunningly detailed copy of the Zwinger palace from Dresden in Germany. The palace has porcelain from both Europe and Arita on display. Behind the palace you even find a European style garden – something not so common in Japan. 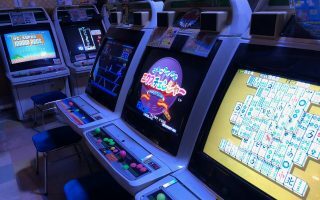 Japan is just one of those wonderfully different places where you can find a perfect copy of a European palace, located in what is hardly more than a countryside mountain village. The porcelain park is located about 4km / 2.5mi from Arita station. I recommend you take a car or bike there, but you can walk in just under an hour. This is the place where the first Kaolin was discovered in Arita in 1616. For hundreds of years after the first Kaolin discovery the mountain was mined for its material. Today the mine is not in use anymore, but it has left interesting marks on the mountain after so many years of use. 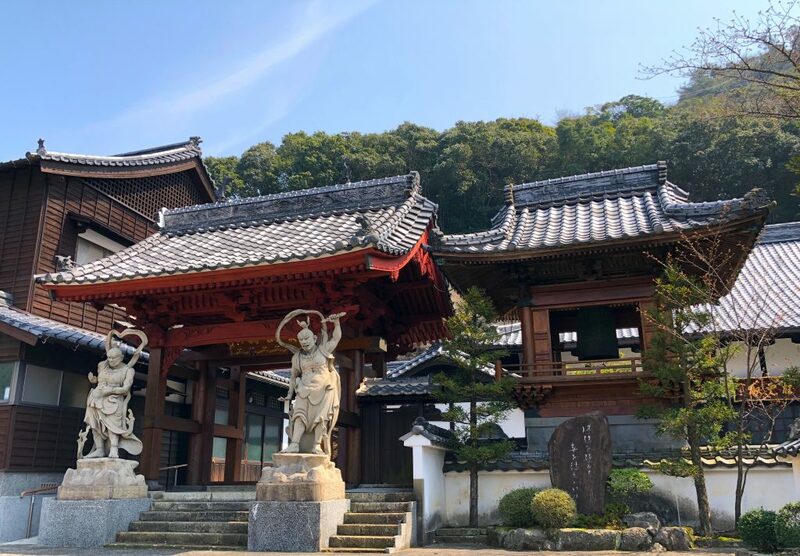 This is a historically important location, hence it’s also an attraction which ranks high on the list of things to see in Arita. Izumiyama quarry is a 15 minute walk from Kami-Arita station. Arita town has produced a useful tourist map in english. The map is available at the train station, or digitally as a PDF on their website. 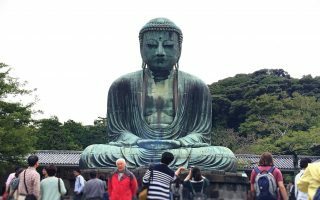 If you are interested in Arita, you might also be interested in my posts about traveling Japan on a budget, Dazaifu and Tocho-ji temple near Fukuoka. 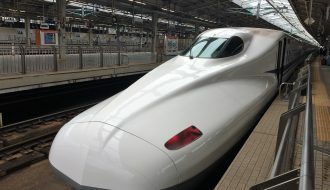 By train: from Hakata Station, take the “Midori-Huis Ten Bosch” line and get off at Arita Station. 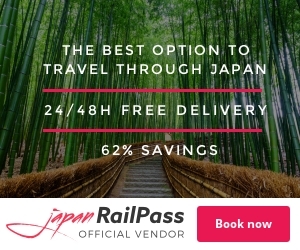 The train ride is about 80 minutes long and is covered by the Japan Rail Pass. From Nagasaki Station take the Nagasaki Line to Haiki Station and change to the “Midori-Huis Ten Bosch” line which you stay on till you reach Arita Station. The ride is about 2 hours long and is also covered by the Japan Rail Pass. 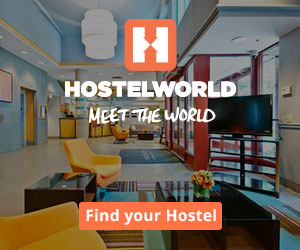 Planning a lot of train travel while train? 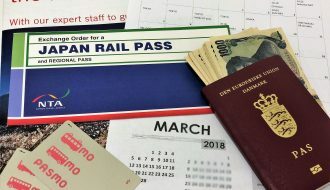 Maybe the Japan Rail Pass is something for you. We so enjoyed our time in Arita! Beautiful quaint village with tons of history and wonderful shopping!! Arita really is charming, isn’t it? Can you please tell me if all the pottery shops 3rd in At its open on Sundays. Hi Tony. I can’t say for sure. However small shops in Japan tend to be closed on Sundays.